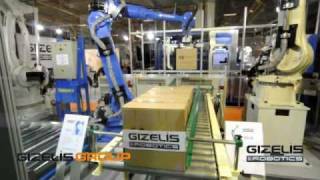 Palletizing / Unpalletizing procedures are highly recommended for the use of robotic arms. Capabilities for large payload handling (up to 1300kg), high speeds and extended operating radius (3200mm) turn said robots into an essential part of manufacturing units. Regardless of the material to be handled (sack, carton box, tin or bottle), this robotic arm picks-and-places with utmost precision (≤0,25mm). It may also handle multiple product lines concurrently, as well as different types of products by means of special grippers, thus further increasing the degree of system flexibility. The selected gripper (manipulator, vacuum cup, magnetic etc) may handle all manufactured products and, in some cases, accommodate empty pallets feeding in lines. 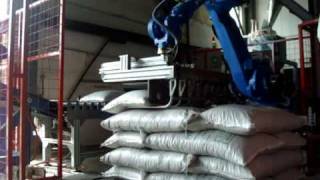 The major difference between a robotic arm and conventional palletizing machines is that it may be easily customized to any place, since it is programmable and is be configured to avoid all natural obstacles (support columns etc) in order not to engage valuable working space in a factory. Another significant advantage is that it may run problem-free even under freezing conditions of less than -30˚C, thus establishing robots as the ideal partner even when working inside refrigerators. A comprehensive palletizing line includes, apart from the robot and gripper set, product conveyor belts, automatic pallet feeder for attaining higher speeds, ready pallet roller conveyors, pallet transport wagon for large areas, and automatic pallet wrapper with stretch film, automatic strapping machine, and safety fence for personnel safety. Uninterrupted production for 24hours a day. Reduction in production costs since multiple lines may be accommodated with no personnel being involved. Rise in production since a robot adds speed to production lines. Capability to handle loads that man cannot (heavy products). Tall pallet stacking capabilities (up to 3 m). Space savings since, by accommodating multiple lines, less space is required compared to conventional machinery and finished pallets are discharged directly into the warehouse. Operating in harsh working environments. Offline programming capabilities for new products with no need to halt production.